Steele said that he was asked to write the history of fire stations 22, 12, and 32 for the fire company’s centennial in 2004. The resulting 300-page book traces the fire company’s history from the earliest efforts to organize fire protection for the town to the 2013 dedication of Station 32 in London Britain Township. 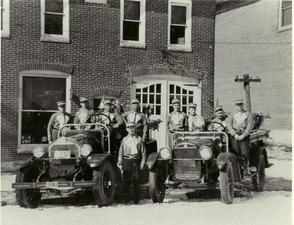 Steele was particularly interested in how the West Grove Fire Company came to be, in part because it took several attempts to accomplish the goal, and in part because many of the people who were responsible for starting the fire company also played pivotal roles in West Grove’s development. “The group who helped start the fire company is a who's who of West Grove pioneers,” Steele explained. 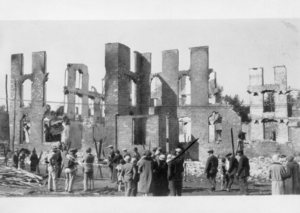 In late 1887, a fire struck in Avondale, prompting residents in neighboring West Grove to consider establishing a fire department to serve the community. A group of West Grove's most prominent citizens gathered in November of that year to discuss the matter, and there was enough support to schedule a second meeting. Within a month, twenty-five residents came together and signed a petition to support the charter for a fire company. A five-member board of trustees was formed. And then, for reasons that have been lost to history, the effort never came to fruition.